Music has a longtime status as one of the best parts of our lives. Bringing it together with driving a car seems like a great thing, right? With everyday improvements in technology, it’s understandable that we want more in our lives. It’s not enough just having an entertainment system in a car, but getting the perfect one. It all comes down to a simple wish: playing your favorite song in perfect audio quality. It’s crucial to have good speakers in order to experience the perfect sound. After all, they transform power into sound, and they are also in charge of the sound quality. The question that arises is: are you satisfied with your factory-installed speakers or you need more power and higher quality sound? It often happens that factorial car speakers can’t fulfill our needs for high clarity sound and performance. With GTO609C people from JBL are continuing their great work with car electronics. 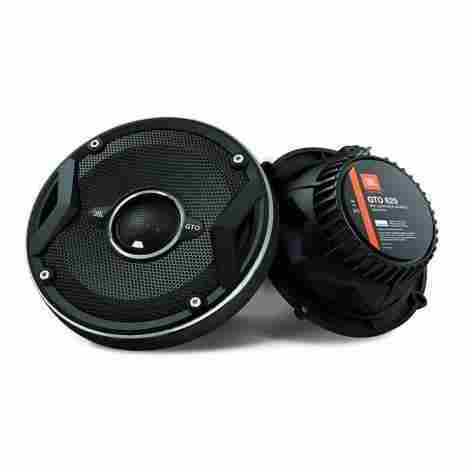 This is a component car speaker that has separate tweeters and woofers which provide better overall sound quality compared to standard coaxial car speakers. JBL GTO609C is made with carbon-injected polypropylene material to withstand high output levels which make possible producing high clarity notes. Additionally, its cones are made a bit larger than usual, which means that they move more air and produce more bass. Therefore GTO609C offers clear audio output and good bass response thanks to JBL’s innovative design. Additionally, with impressive sound quality, GTO609C speakers are amongst the most popular 6.5 component car speakers on the market! Speaker sensitivity is, in short, the ability of the speaker to convert power into sound. Average speaker sensitivity is 86-88db, and JBL GTO609C car speakers proved to be quite efficient, with a sensitivity rating of 93db. For us, this is one of the main reasons for placing this product this high on the list. They’ll sound even better when powered by an aftermarket stereo! If you are really eager to see what they can do, you can power them up with an external amplifier and watch them handle up to 90 watts RMS! Now to the second important thing about car speakers: all speakers have two power ratings – Peak and RMS. The RMS is the speaker’s ability to produce continuous output without getting damaged. Peak allows you to know what amount of power (measured in watts) a speaker can handle instantly. JBL GTO609C has exceptional results here as well. 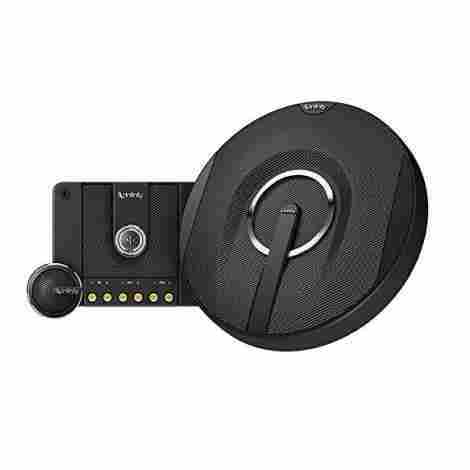 The product comes with an amplifier capable of delivering up to 270 watts of power with an RMS rating of 5W-200W, and they match to systems powered with head-unit or factory-amplifier power levels. Obviously, JBL GTO609C can satisfy a wide range of customers, including high-fidelity audiophile listeners. The downside with these speakers is their low-frequency response. However, that is mostly up to individual preferences. One of the best things about these speakers is that by buying them, you basically get the best sound quality for the price range they belong to, and they’re quite affordable at the same time for an average consumer. Their high rank on this list is deserved not only by their exceling high-profile features, but also providing the customer with the best bang for their buck! 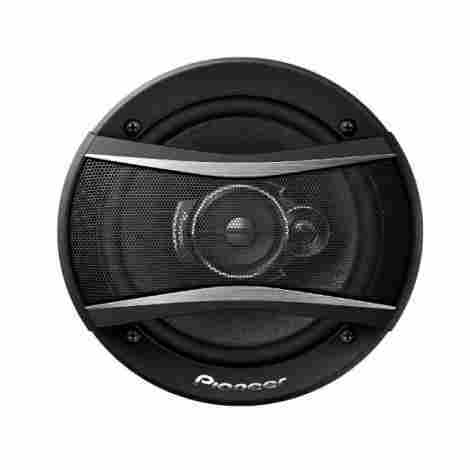 Pioneer TS A1676 is widely considered as one of the best picks within this product category. The main reason for its high placement is its cone design: the speakers have unique multi-layer mica matrix cone design, which makes them more rigid than standard speakers. The result is a wider sound dispersion with deeper bass, and overall clearer and better quality sound. This technical improvement by Pioneer provides better speaker performance and sound quality in various popular music genres, such as hip hop, trip hop, alternative rock or dubstep, giving you a whole new level of listening experience! 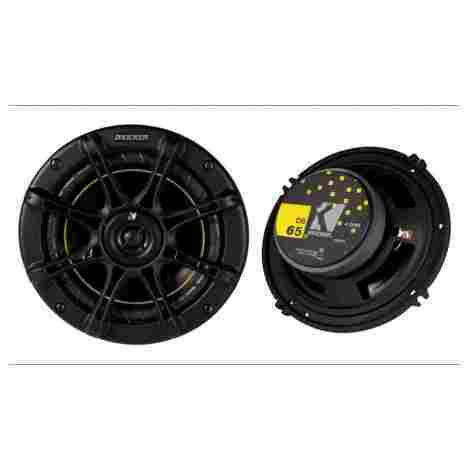 With a sensitivity rating of 90 dB Pioneer TS A1676R belongs to the group of above average car speakers. It also has a lightweight elastic polymer surround, which allows for high speaker sensitivity, resulting in a very clean and crisp sound. What is also great about these car speakers is their tweeter design. It can deliver a wide range of mid to high frequencies and optimizes sound quality at higher volumes. All audio frequencies are very well balanced, which means that even drastic frequency changes don’t affect the quality of the sound output. Pioneer TS A1676R is one of those easy choices when you’re in a dilemma, with the capacity to satisfy most of your car audio desires. And there’s no better audiophile feeling than bursting your volume loud on your favorite song and getting that crystal clear output, right? As mentioned above, there are two power ratings crucial for power handling capacity. 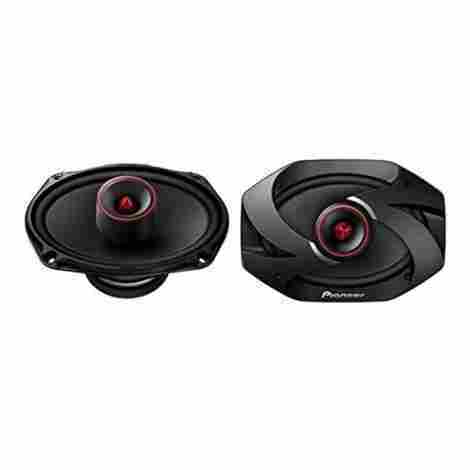 Pioneer TS A1676R has the RMS rating of 50 watts (25 watts each) and the peak of 320 watts, meaning these car speakers can handle instantly high power levels just fine. When it comes to remaining the high power sound continuously it can be a little bit weak. True to be told, even with lower RMS rating, quality of these speakers makes them durable. The only notable downside is the speakers’ tendency to distort the bass a little bit. That can be a bit of a drag, especially if you are a lover of loud music. Another great thing about Pioneer TS A1676R speakers is their price. You can enjoy premium quality sound without significantly hurting your wallet. By buying these speakers you can be sure that you’re getting great value for money! Another great model comes from Alpine Type-S series. 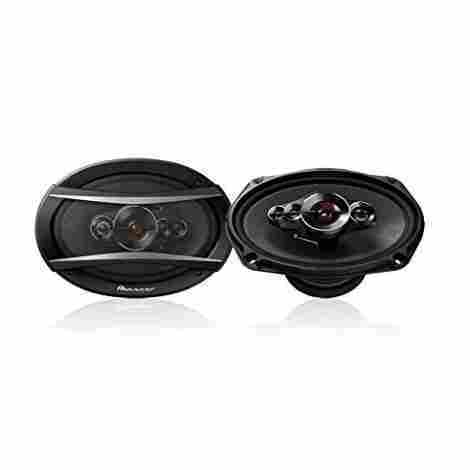 The best thing with these car speaker series is their ability to produce good quality sound, and at the same time requiring less power to project at high sound volumes. For that reason, Alpine SPS-619 is placed third in out 10 best car speakers list. As we will show later, these speakers maintain great audio while keeping high power handling. The Alpine specialists made sure that SPS-619 covers a wide frequency range and impressive tone definition, even at low power levels. They can be an addition to the factory stereo or a more powerful aftermarket stereo. Either way, with these speakers you gain immediate and powerful improvement to your sound system. The SPS-619 has a sensitivity rating of 90 dB, which is pretty good. It proved to be very efficient even if it’s not the loudest speaker out there. This rating reflects how efficient the speaker is at converting power to volume. It happens in some cases that average number of dB or watts shows very good results in testings. That’s the thing with SPS-619! It may look that you would not gain much sensitivity, but these speakers still maintain impressive results. With 260 watts peak power (520 per pair) this speaker model performed really well in volume tests. While it seems that RMS of 85 watts would test out averagely, the speakers’ results were above expectations. In addition to that, Alpine SPS-619 doesn’t require too much power from the amp to produce loud volumes at all. The best part is that Alpine SPS-619 has two tweeters that effectively minimize high-frequency distortion from the woofer, meaning you will not experience harsh sounds that irritate your ears at louder volumes. Take note that its midrange isn’t as good as the highs and lows. However, it still has an impressive quality for its price range. It's most likely that you won’t even pay attention to this on an everyday basis. Because of its good performance in audio frequency tests and excellent efficiency, Alpine SPS-619 is among three top car speakers on our list. Its price isn’t as attractive like Pioneer’s TS A1676R, but it stays in the range of affordable yet high quality speakers. So if you are looking for an upgrade of your factory speakers, Alpine SPS-619 might easily be the right choice. 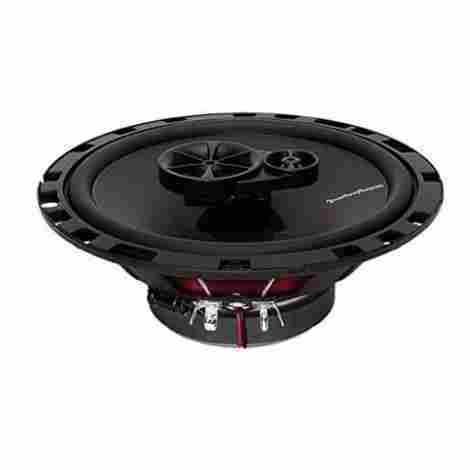 Rockford Fosgate R165x3 enjoys great popularity among car speakers. There are plenty of reasons for this, as we are going to see later on. Rockford Fosgate is a safe bet when you are looking for a combination of value, style, and function. Although we can’t expect exceptional bass from a coaxial speaker, you will be impressed by the quality of audio produced by R165x3. These speaker’s crossovers are designed with high-grade materials for emitting high-quality sound of any frequency without much distortion. The R165x3 model has a sensitivity rating of 91 dB which is pretty good. The speakers are capable of providing crisp and clear sound even at the higher volumes. The main concern with R169x3 comes from power handling. It has a continuous power handling of 65 RMS watts and a peak power handling of just 130 watts. This can be a problem for people that love to listen to very loud music in their car. Choosing this product would require some caution when playing music, due to the chance of speaker damage. The Rockford Fosgate R165x3 definitely belongs to the affordable price range. Many people find its price quite attractive with all the features that follow the product. Pioneer TS6900 PRO is one of the products that look tough and very modern, and also provides excellent sound quality. These speakers have an aggressive blade-like grill with a shotgun tweeter which gives them a mean appearance. They are strong, loud and provide a great audio performance overall. It seems that they covered all the aspects, right? On the other hand, the modern aggressive look has a downside: the shotgun tweeter sticks out from the woofer significantly, which means that it might be harder to fit in some vehicles. The Pioneer TS6900 PRO has a sensitivity rate of 92 dB which is great and can compete with our first product on the list. It has also an impressive high-frequency range. Here we came to the second best thing about these speakers: the excellent power handling specifications. The continuous power rating is 100 RMS watts. It’s not that much, but the 600 peak watt rating is among the highest. It’s really efficient at converting power to volume, and there lies its best characteristic. One of the downsides of Pioneer TS6900 PRO is its price. It definitely isn’t the most affordable car speaker on the market, but true to be told, it’s not the priciest either. If you are able to spend some extra bucks on car speakers, Pioneer’s great features will definitely make up for the difference. Alpine’s SPS-610 sensitivity rate is 88 dB. That is an average point for one speaker, enough to produce high-quality sound, but not very impressive. However, it’s good to remember that numbers don’t vary that much in this case. The rate of 88 dB is not as strong as 90 dB, but it really isn’t an enormous difference. With the peak power of 240 watts and RMS power of 80 watts, Alpine SPS-610 has decent power handling. It isn’t the best on the market, but it can surely take the high power pressure. Even if this product has downsides, one thing is certain: Alpine is known for using high-quality components and materials, and this model will produce a clear and crisp sound in your car. Additionally, this product is very affordable, and if you’re not a member of that harsh audiophile jury when evaluating speakers’ capacity for producing those deep bass sounds, this model can be just the right choice for you. The Kicker is known for its high-quality electronics, and DS65 is not an exception. It is very popular because of the clean highs and pretty good mid-range sound. The main drawback of these speakers is lack of bass. It is there, but it can be insufficient if you are a profound lover of low notes. This flaw can be easily fixed with some subwoofers though. The Kicker’s DS65 sensitivity rate is 90 dB. Crazy, right? It is a great feature for coaxial speakers. With the level of 50 RMS watts and peak power of 100 watts, Kicker DS65 definitely falls out when it comes to power handling. However, that flaw can be supplanted with taking into account the quite high sensitivity rate for coaxial speakers. In the end, it all comes down to individual preference. The model is perfectly affordable and at the same time a very valuable upgrade for your car. Kicker DS65 offers clean sound with excellent treble and mid-range tones. If you are not crazy about having deep and extraordinary bass, DS65 will fulfill all your other music needs. And let’s not forget the best part – a quite affordable price! Infinity Kappa continues the tradition of producing great component speakers with the 60.11CS model. This speaker is very popular for its natural-sounding high frequencies. It has received positive reviews for its loudness and its great sound fidelity. Some complaints come, however, for the lack of deep, punchy bass. It is quite a flaw for a component speaker, true to be told. Never the less, it maintains a great sound performance. These speakers are very sensitive and don’t need a lot of power at all. On the other hand, having a sensitivity rating of 93 dB allows them to produce a great deal of power. 60.11CS has the RMS power of 90 watts and 270 peak power. It’s a pretty good level of power handling, although it could be better coming from the component speakers. Infinity Kappa 60.11CS is one of the priciest products in the market. However, if you want something a little bit more sophisticated and you are able to pull out a few extra dollars, this remains a great option. Pioneer TS-A6996R is an older, yet still one of the better Pioneer’s products. These speakers deliver improved bass and dynamic range with impressive power handling abilities. Its quality materials provide clear sound with outstanding responsiveness sensitivity. The Pioneer TS-A6996R speakers are designed to be small but powerful and easy to install. Their black color and almost oval design give them an edgy look, which is very popular these days. The truth is that some of the newer Pioneer models like PRO series have surpassed these particular speakers. Nevertheless, they have lot of good qualities which earned them a place in our list. Pioneer TS-A6996 just shines with a sensitivity rating of 93 dB. It is a very efficient speaker, for sure! The other side of the coin is that its high-frequency accuracy isn’t that great. With continuous power handling at 100 watts and peak power of 650 watts, these Pioneer speakers are really impressive, maintaining one of the highest power handling capacities. Pioneer TS-A6996R has numerous features that make it a great option if you’re looking for high value for your money. However, you should take into account that there are other brands in the market with similar sound quality, and yet a lot cheaper. That can withdraw people that are not too fond about purchasing the recognizable brand. Another good quality car speaker comes from JBL. GTO629 is a coaxial speaker that has a textile dome tweeter. What is so great about this speaker is its system. It has a punchy and well-defined midbass that works great with lower registers. It also bring high clarity and quality tone in the higher midrange. JBL GTO629 is a 6.5-inch speaker. It’s smaller dimensions make it very adjustable. It can be placed in various spots in your car, e.g. low down in car doors for providing a lifelike quality of the sound. These speakers have a high sensitivity rating of 93 dB. That is a really impressive sensitivity rate for coaxial speaker! The GTO629 system has a 60 watts RMS and 180 watts of peak power. It isn’t the best controlling system, but it can still take a lot of power. However, those who are fond of really loud music should take this into account and maybe search for another option. Taking into account all GTO620 features, the price isn’t high at all. It is one of the more affordable car speakers. 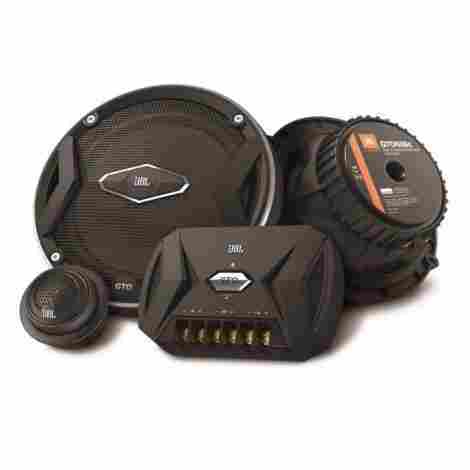 Additionally, JBL is a reliable brand, well-known for the quality of their car electronics. The chance to make a mistake with choosing one of their products is negligible. What we can agree on is that everybody wants a good speaker system in a car. It just makes driving much more enjoyable, especially for music lovers. But if you’re not an industry geek, choosing the right product can be hard. That’s why we provided information about different types of speakers, sound quality, material, and the cost. 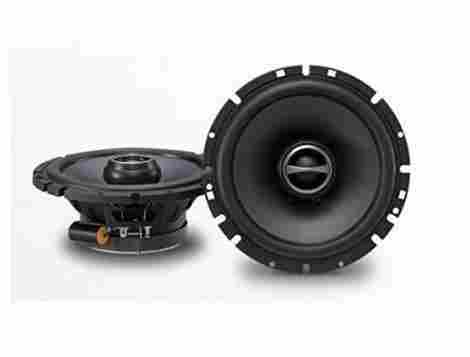 These characteristics were the criteria we used for finding the best car speakers. We know that there’s a lot of people wanting many different things when it comes to car speakers. It’s the matter of car type, music taste, price, and other preferences. As we can’t just assume what every customer wants, we made an effort to take into account a wide range of product preferences when deciding on which products make the list. As we mentioned above, there are two types of speakers: component and coaxial. Both types have benefits and drawbacks. Component speakers provide better sound quality but with coaxial speakers, you have it all (easy installation and don’t need crossovers) with less money. We tried to take this difference into account before making the list. The second big concern for us was power handling. If we want to get the most of our sound system, the speakers need to be able to handle power coming from the head unit or the external amplifier. Power handling refers to the level of power (measured in watts) that the speakers can take without getting damaged. Our criteria were, therefore, RMS and peak power that provides great power control. The speakers with the ability of higher power handling are rated better on our list. It’s our logic that, even if you don’t want especially strong speakers, you want to avoid all chances of damaging them. We wanted to make sure that we chose quality speakers for our list. What does this include? Well, what is important for every product is the quality of its production materials. We also took into account overall sound quality of every particular speaker, even if in some cases the numbers weren’t so great. It often happens that some speakers don’t have impressive numbers and ratings, but they do show great results with the customers. Therefore we kept in mind the customers’ reviews. Of course, one of the main things that we had to consider is the price. Not only that the balance between cost and value of the speakers have great importance, but you also don’t want to end up realizing that your new speakers need some additional reinforcement. That’s a strong hit for every home’s budget. Therefore we picked the products not only by their cost, but also by their overall quality. We went through some of the most important car speaker features. However, there are always some additional factors to consider when you want to make the purchase. We want to make sure that our pick is the best one, right? The real question here is what type of audio system do you really need? Some people just need a pair of speakers so they can casually listen to some light tunes while driving. Others want a full multi-component sound system that can really blast out that power metal solo. You have to decide what you need from your speakers and what kind of music you’ll be playing. That will determine the type of the system and the type of the speakers you need. There are many different features that car speakers offer. Again, you will have to ask yourself what you really want from your speakers. Is that a very loud sound, powerful bass or clear and perfect sound reproduction (or all of the above)? With some speakers, you can get the most of these features. In most cases, there is always one feature that is better or worse than the others, and that’s when you need to decide according to your needs and budget. While taking into account previous factors, it is also important to decide do you need an amplifier or not. The amplifier is a great solution when you want more power and better sound. If you want to upgrade your aftermarket speakers, the amplifier is the best choice. In that case, you should look for speakers that can handle more power. To get the perfect balance between the components in your car you should match the output levels of amplifiers and speakers. This is a really important factor because in other case you can seriously damage your speakers. That’s why we insisted so much on the power handling specifications of each product. If you send too much power over the amplifier, you can break or blow of the speakers. Look carefully at the RMS and Peak power while choosing the speakers. Then you can match your speakers with other car components without causing any damage. Speakers can drastically change the driving experience. They don’t raise the value of the vehicle but they definitely make the driver’s quality of life during driving much better. It’s not such a good idea to have low-quality speakers in an expensive car (and another way around). You should try to gather some information about your car (model, year of manufacturing etc.) and about desirable speakers for it, in order to be able to make a proper match. Don’t forget to look up for the sizes of the speakers. You don’t want to end up with an unfitting product in your hands. Q: What kind of a difference do new speakers really make? A: Having a relatively late-model vehicle often means having a premium sound system. However, if you have a midrange or bellow car model, the chances are that you have only decent audio quality installed. In that case, new speakers can make a sizeable difference. With new speakers, music sounds crisp and clear, much more like the way it was recorded. The other advantage of new speakers is their durability. Aftermarket speakers are made to last. Factory-installed speaker systems can start deteriorating after a year or so, forcing you to get a set of aftermarket speakers anyway. Q: Can I install my new car speakers myself? 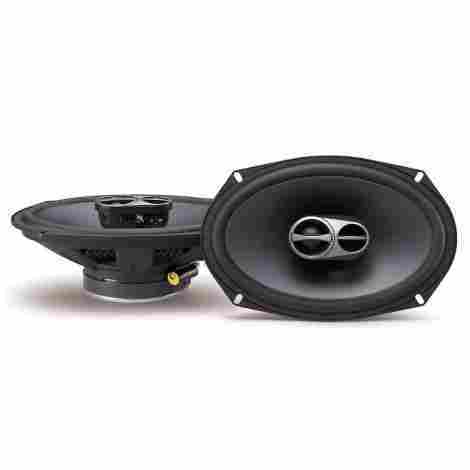 A: One of the great features in aftermarket car speakers is an easy installation process. You can install most of the car speakers by yourself, using tools you already have in your house or car. The process is easier if your speakers are of a coaxial type. In that case, you only have to remove your old speakers and put the new ones in their place by simply connecting a few wires. On the other hand, component speakers can be more demanding. It’s not that you can’t do it by yourself, but it takes some additional effort. Q: Is it necessary to have a car audio amp? A: The factory-installed stereo definitely doesn’t have an amplifier. However, even if aftermarket audio systems often contain built-in amplifiers, they are usually not very powerful. What exactly separate amplifier offers? In the first place, they get the most out of your new speakers. They improve the sound quality and provide louder sound without distortion. Additionally, when you add a subwoofer to your car audio system, you will need an amplifier. Adding amplifier involves spending more money, which can’t be overlooked. So if you don’t mind a little distortion, and you have no desire for listening to very loud music, you can easily skip getting an amplifier. It is not the most crucial thing for a car audio system, but it is a powerful addition. Q: Will car speakers work on the home stereo? A: This is a frequent question of the first time car speaker buyers. Can you use car stereo equipment in a home stereo? Yes, you can. However, you should check if your home stereo unit can handle the lower impedance of most car speakers. Their impedance is about 4 ohms and most home receivers can take 8 ohms. In that case, you would need two identical drivers or receiver capable of driving 4 ohms. Q: Do I need to replace all the related equipment while changing the factory speaker? A: If you are changing your factory speakers, you will probably want all that old stuff out. It’s not just that the old equipment may be used up and therefore unusable, but the new speakers will probably demand special kind of equipment, designed especially for that model. Most of the speaker manufacturers give all needed important equipment together with the speakers, so you don’t have to search for it on your own or pay extra. Q: How car speakers are measured? A: When you are searching for the right speakers, you want to know if they can fit in your car. You can always search the information about your car model and get the proper measurements from the manufacturer. However, if you want to be sure, or you just can’t find this information, you can do the measuring by yourself. First thing first: installation space. Measure the length and the width of the area where your speakers are going to fit. Get the right measurements from the outside diameter of the speaker. That is the length between the two ends of the speaker’s diameter. The next step includes measuring the diameter of the speaker’s magnet. Even if it seems that the magnet is the same for every type of speaker, it is quite the opposite. Another thing you will probably need to know about the speaker’s magnet is its height. Don’t forget to do these last two steps, because they are crucial for the proper fit. In the end, you will need measurements of the mounting height and depth. You can determine the first one by measuring the distance between the speaker’s rim and the bottom of the speaker’s flange. On the other hand, the mounting depth is the distance between the rim (make sure to measure it from the bottom of the rim) and the bottom of the speaker’s magnet. Compare your specs with the ones of the speakers you want to buy, and you are set to go!